Robert Acheson Sheldon is the only known conscientious objector among the staff of the University College’s during the First World War. Aged 36 he was living in Arboretum Street and working as a lecturer in Electrical Engineering in Nottingham when conscription was introduced in 1916. Being ‘of age’ Sheldon was required to join the army and fight in the war effort but this was diametrically opposed to his beliefs as a Quaker. While Quakers were pacifists who objected to killing, they contributed to the war by supporting those affected by it, and by funding and building hospitals and disaster relief campaigns. Mike Noble, of the Centre for Hidden Histories, which is part of the Faculty of Arts at the University of Nottingham said: “There was an immense amount of social pressure on people to join the war. There was great public support for it, which never really wavered, and as people lost sons, brothers, fathers and husbands it became harder for them to accept those who refused to fight. Sheldon was a member of the local Quaker meeting in Nottingham and his committed beliefs meant that at the end of 1916 when he received his conscription papers he went to his employers and reported that he was a conscientious objector. In Council meeting minutes from 23 May 1916 it is noted: ‘A letter was read from Mr R.A. Sheldon, Lecturer in Electrical Engineering, stating that as a conscientious objector, he was unwilling to attest, but he was willing to join the Friends’ Ambulance Unit or some approved National Service Organisation. He also asked whether the Council would support his appeal for exemption and whether, in case of joining one of the different organisations, his post would be kept open and he would be treated as though he had joined the Army. Resolved that Mr Sheldon be informed that the Council will not support his appeal for exemption and that the other question raised by him will be taken into consideration should the necessity arise’. This was a key moment for the College and subsequently involved members of the Finance Committee. As the war had progressed there is evidence that the College was struggling financially. Early records show donations made to various charities and war refugees as well as comparatively generous allowances made to staff serving in the war but by mid-1916 it was clear finances were tight. Sheldon later informed the College that he was arranging to volunteer for the Society of Friends’ War Victims Relief Committee as a stretcher bearer but asked if he might be eligible for an allowance (as serving members of the Army received) and if he could reapply for his job once the war was over. Mr Noble said: “This was a precedent for the College. Those who went to fight received an allowance, pension payments and their job kept open for them but as war continued that became more financially constraining. It was clear that Sheldon’s request divided opinions- from a financial perspective as well as a social and personal one. Sheldon wrote to the College and asked if he could be permitted to resign instead of being dismissed. This was agreed and the matter was resolved. Sheldon later wrote to the College from Northern France in June 1917 to update them on his activity. Although the College did not record what this work was, it is known that he served with the Friends’ War Victims Relief Service in France from April 1917. 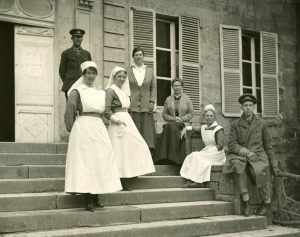 According to records held by the Library of the Society of Friends, Sheldon was initially stationed at Sermaize before moving on to work at Bettancourt in a chateau lent by the Comtesse Marillot, for use as a convalescent home for child refugees. It is believed that he worked there alongside his wife, Gladys, who he had married in 1912. Robert and Gladys finished their service with the FWVRS in September 1918. It is thought that Robert died in 1959 in St Albans. Return to the University’s commemoration page.